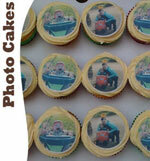 For that extra-special personal touch on your cakes, Louis's Larder can add your very own photographs to the design. 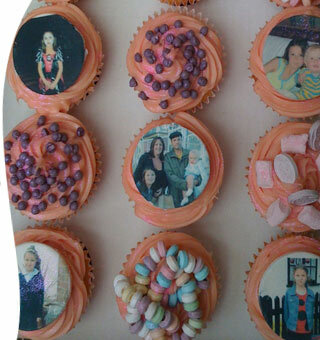 Using special 100% edible printing ink and icing, we can add your photos to cakes of all sizes - from our large celebration cakes to our cupcakes - to truly personalise your order. Our photo cakes make fantastic unusual gifts and are also perfect for celebrating special occasions such as birthdays, engagements or even weddings. 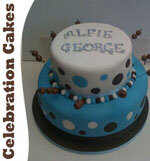 So for your very own personalised photo cakes, contact us today on 07793 061344 or via sarah@louislarder.co.uk. 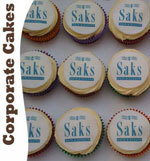 Also, great for promotion of your business or organisation, try our corporate logo cakes. 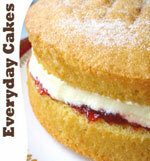 Louis's Larder produce personalised, handmade cakes in Derby and Nottingham. 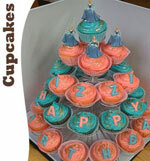 From birthday cakes and celebration cakes through to cupcakes, Nottingham and Derby areas can have their cupcakes delivered for just a small fee, with free delivery within 5 miles of Spondon, Derby. Our delicious cakes are all made form the finest, freshest locally-sourced ingredients and can be totally personalised to your needs. 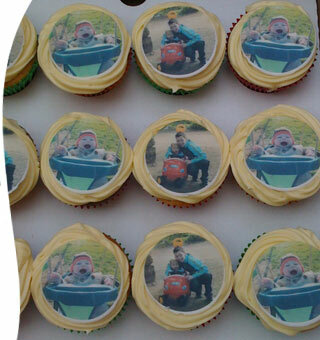 Our personalised cupcakes and corporate logo cakes can have your own photos or logo added to them, printed with special 100% edible icing and ink, for that truly personal touch.